This unique sonic face massager helps to restore glow and firmness to the face when used with any Nurse Jamie serum, eye cream, or your favourite moisturiser. Targeting problematic areas, including eyes, lipline and cheeks, this revolutionary tool has two massaging modes (normal or heated) and boasts hi-frequency sonic technology to encourage optimal absorption of skin care products. 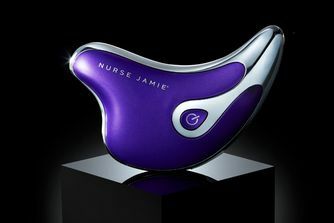 The Triangle by Nurse Jamie is a revolutionary beauty tool that works to restore youthful glow and firmness to the face. Utilising hi-frequency sonic technology, its unique triangular shape means that it can easily target problematic areas – including around the eyes, brows, lipline, cheeks and chin. It features two massaging modes (normal or heated) and is designed to be used with any Nurse Jamie serum, eye cream or your favourite moisturiser, allowing for optimal absorption of skin care products. Rechargeable and travel-friendly, it’s a doddle to use every day and even features an Intelligent Touch sensor so that it starts working as soon as it touches the skin. I bought this massager a year ago. Either I got not a working tool or this stupid device. I use this massager for a year and it does not give any results. I absolutely do not recommend buying it and wasting your money. Temporary effects. Don't waste your money. I like it. Unfortunately, instruction without pictures, only text and I was looking for video instructions. This isn't suitable for a small and thin face in my opinion. I really have come to love using this tool daily, especially on the warm settings. The inflammation and saggy skin has diminished and it feels wonderful. Also, I can hit every angle and nook on my face and neck. I've bought and didn't do anything for me a total waste of my money. I feel like nurse Jamie is just branded well and product in my experience don't live up expectations.